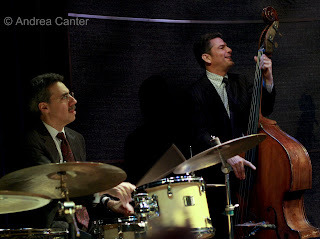 John Pizzarelli came back to the Dakota, just about six months since his memorable visit last summer. He again brought his working band—brother Martin on bass, Tony Tedesco on drums, and the should-be-better-known Larry Fuller on piano. The late set was hardly sold out but as far as John was concerned, he was playing the Carlyle in Manhattan on New Year’s Eve. The chatter was festive, the band swinging, the vocals buttery and warm. Pizzarelli was literally born with a song in his heart, the son of one of the genre’s living legends, Bucky Pizzarelli, himself a recent star on the Dakota stage. As Lowell Pickett noted when introducing the band, the two greatest performers on seven-string guitar are both named Pizzarelli. And they share more than their instruments—both generously share the stage with their band mates, both know how to charm an audience into rapt attention. Bucky is far more low key than his exuberant offspring. If John isn’t singing, he’s talking, telling tales of the songs and songwriters interspersed with a stand-up comedy routine ripe for Vegas. It’s pretty entertaining without the music, but the music is the main event. 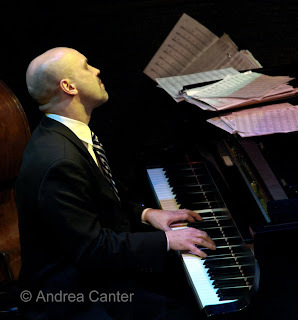 The Great American Songbook is John’s playground, his most recent release, With A Song in My Heart, focusing on Richard Rodgers. He covered some of that territory during last night’s second set (the title tune, “I Have Dreamed” and “Johnny One Note,” which lends it self readily to Pizzarelli’s hijinks). From his Sinatra tribute he pulled the beautiful “In the Wee Small Hours of the Morning” –which it nearly was when the 90-minute set was over. The tune also served as a launching pad for his most hilarious schtick of the night, recounting the serendipitous meeting of songwriter David Mann and Sinatra that made this the title tune for one of The Chairman’s hit albums in 1955; throughout the tale, Pizzarelli overlaid Manhattan insider taxi chatter. The lyrics alone are delightfully silly on “Rhode Island” (“Pencils come from Pennsylvania....” you get the idea) and John tipped his guitar to the songs of Bobby Troup and Nat King Cole. But the highlight of the evening came last, an encore that grew from “Polka Dots and Moonbeams” into a medley of at least six or seven fully presented love songs—I lost track, but in between “Polka Dots” and “As Time Goes By” we heard “More Than You Know,” “Misty,” “In the Mood for Love,” and a couple more—a fifteen minute coda to an evening that warmed the heart and fed the ear. Photos: (Top to Bottom). 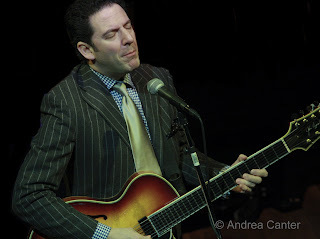 John Pizzarelli has one of the most expressive faces of jazz musicians; Larry Fuller swings and zigs and zags across the keyboard; Tony Tedesco and Martin Pizzarelli keep the pulse going strong. Photos by Andrea Canter, January 25th at the Dakota.